Numbering only six, the Null-class Advanced Recon Commandos were the first clones of Jango Fett created by the Kaminoan cloners, and the prototypes for the Grand Army of the Republic. They were deemed a failure by the Kaminoans and were not put into mass-production. However, Mandalorian mercenary Kal Skirata saved them from termination by the Kaminoans and later adopted all of them. 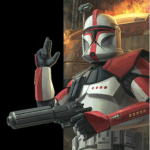 NOTE: This clone wears Phase I (Episode II) armor with additional paint and accessories. Only those additional items are listed here. Fett-style Range Finder on right side of helmet. Mounted in the ear, not to the outside. Stalk should be metal colored. Range finder should be black.